Skip the bus and leave the driving to a skipper. 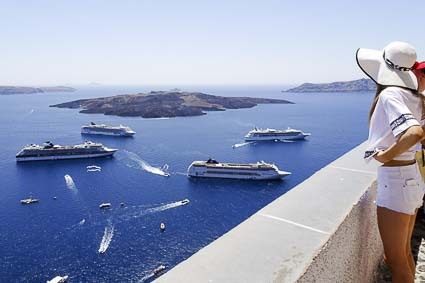 ABOVE: Tenders take passengers ashore from cruise ships in Santorini, Greece. Put off a European vacation because you lack the patience to plan an itinerary, haul yourself and your belongings from city to city, and cope with foreign languages along the way? Thought about an escorted tour, but rejected the idea because touring with a group seems too much like a class trip? Wished you could visit places like Corsica, Dubrovnik, or Spitsbergen that sound intriguing but aren't convenient to reach from where you live? Complained about the need to unpack every night and pack again the next morning? If your answer to any of these questions is "yes," it's time to consider touring Europe on a ship or boat. The idea of cruise-based travel is simple: You sail along Europe's coastline or inland waterways, stopping frequently for shore excursions. It's like staying in a moving hotel that takes you around Europe: You unpack once at the beginning of the voyage, and you never have to touch a suitcase again until it's time to leave the ship. And when you're finished with each day's sightseeing, you can return to the familiar cocoon of your cruise vessel for dinner, conversation with your fellow passengers, and a good night's sleep.